May 31, 2013 at 7:41 am Interesting that 1936 was hotter than 1998 and yet it hardly lifts off the abscissa of the IPCC graph. May 31, 2013 at 6:47 am If you put this escalator over the past 2,000 years, you’ll see a very pretty up and down wave. With two times even warmer than today. C’mon – Lets play fair. The best humor comes from pointing out the irony in the truth. Where is the truth? Where is the humor? Anthony's probably saying to himself "TGIF and oh well, there's always next week". I suspect that Gary was looking at a graph of summer temperatures in the US, and thought it was annual and global. You're being much too kind, Lars. I just did a quick google and see that Gary has been on WUWT denying facts for years. 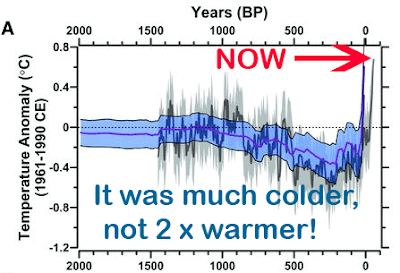 At least since 2009, going by this denial of glacier retreat. Even if he only read WUWT, he would have come across the global temperature trend on numerous occasions. It takes a committed denier/disinformer to be so blatantly wrong. He can't claim ignorance or a lack of awareness or a simple mistake. Not even though he's a regular on the "The world's most viewed anti-science and disinformation site on global warming and climate change". There appears to be an error on the annotation in the top graph. Surely, Gary's missing 'heat', should be 'temperature'. Gary Pearse and Edohiguma are either half-wits or pathological liars, or a bit of both like Watts.